A "Stop the Sag!" billboard is seen on the side of a building in Brooklyn. Sayinglow-slung pants give their wearers a bad image, a state lawmaker is making the point with some images of his own. Adams is the latest in a series of politicians and other public figures to lambaste theslack-slacks style that has been popular in some circles since the 1990s and amplified by rappers and other avatars of urban fashion. The dropped-trousers trend has been debated in TV shows, city councils, school boards, state legislatures and courtrooms and even decried in song: Larry Platt became an Internet sensation earlier this year after he sang his original song “Pants on the Ground” during an “American Idol” audition. 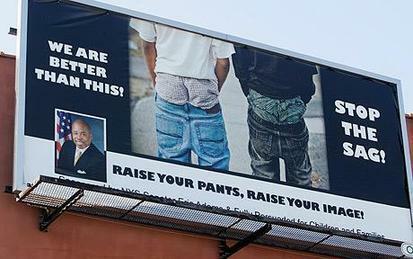 Dallas officials embarked on a “Pull Your Pants Up” billboard campaign in 2007. Some schools have tightened dress codes to get students to tighten their belts. Last summer, a St. Petersburg, Fla., high school principal resorted to ordering thousands of plastic zip ties to help students hitch up their pants. “Everyone on the train was looking at him and shaking their heads. And no one said anything to correct it,” Adams said in a telephone interview this week. So Adams, a black retired police captain first elected in 2006, tapped his campaign coffers for $2,000 to put up the billboards. He elaborated in his YouTube video, which juxtaposes images of minstrelsy and other racial caricatures with shots of sagging pants — all fuel for troubling stereotypes, in Adams’ view. Lawmakers in some places have considered such measures but rejected or dropped them amid legal questions. A plan to fine people for pants that exposed their underwear stalled in the Tennessee General Assembly last year, after the state’s attorney general said it was “unconstitutionally vague.” A Florida judge ruled a similar city law unconstitutional in 2008 after a 17-year-old in Riviera Beach spent a night in jail after being accused of having his underwear exposed. Adams says he doesn’t aim to legislate, just educate. Still, some of the style’s partisans aren’t sure it merits a politician’s attention. “I think there’s other things going on besides someone’s pants being low,” said James Scott, 27, of Brooklyn, his jeans sitting jauntily low on his hips.